THRIVE Farmers Coffee is brewing a new approach to selling coffee. Their model gives farmers a central role in the supply chain, which means better coffee for consumers and a better quality of life for the growers. The idea came from THRIVE’s two founders: Kenneth Lander, a retired trial lawyer who moved with his family to a coffee farm in Costa Rica and Michael Jones, an entrepreneur whose father-in-law is a long-time Blue Mountain coffee farmer in Jamaica. In their own way, both of the founders realized that coffee farmers were missing the action, and they envisioned a more profitable system that has farmers involved from seed to cup—including growing, harvesting, milling, roasting, and selling coffee. Their model protects the economic interests of the farmers, who can earn 10 times what they might make in a fair-trade model, and it lets consumers buy straight from the source. THRIVE works with estate farmers in Costa Rica, Guatemala and Nicaragua. The farmers consign a portion of their harvest to THRIVE, and in return, the farmers gain access to local processing and logistics resources and they share in at least half of the final sales price. The farmers gain direct access to the marketplace, which gives them a vested interest in the quality of their crops. It’s a win for farmers and a win for consumers, who gain a great cup of joe. 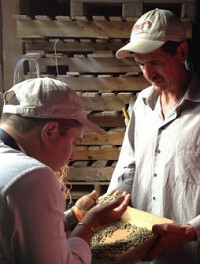 Hi, I’m Ken Lander, one of the founders of THRIVE Farmers Coffee and a coffee farmer in Costa Rica. With THRIVE Coffee you receive artisan quality coffee priced for everyday enjoyment while directly supporting the farmer and their communities. I’m ready to answer any questions – from seed to cup! I love supporting the coffee farmer! What is the best way to keep the coffee fresh when I receive it? Hi Christine! Thanks for the question. Just remember that air and light oxidize coffee. Our coffee is vacuum packed and nitrogen washed. When you open the bag, please store the coffee in an air tight and light proof container. I do love this idea, but not the selections offered..why expresso in all of them ? If you click on the tab labeled "details" right next to the "story" tab, (directly beneath video) you'll see all the options of blends. 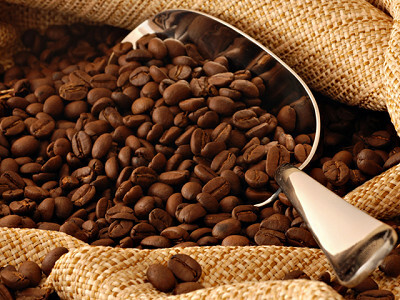 Only one type is espresso, the others range from light to dark roast regular coffee. Thanks for the comment. I will talk with the powers that be on the espresso :-) but this is a great place to let everyone know that the espresso is not a dark blend, but more of a nice balanced medium blend that is excellent made as an espresso but is excellent in traditionally brewed coffee as well, especially with a French Press. We are so excited for you to try the coffee, and appreciate your participation in this launch. I am very happy to read about this! Are there any plans to make a decaffeinated blend? I love coffee, but the caffeine does not love me. Mindy, we do have a decaf offering, and are working with Daily Grommet on providing that. We will report back in a bit on how to provide this offering. 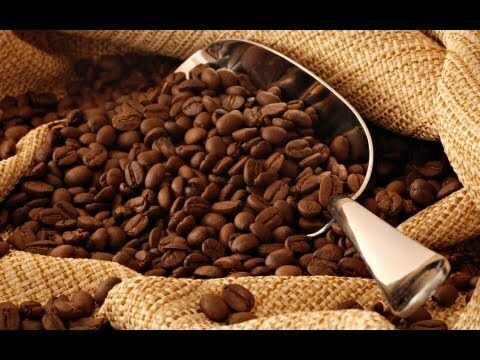 How many ounces are in each bag of coffee? @ UniqueRwe2 I also would like to know how many ounces per bag. Yes, how many ounces per bag?>? Each bag is 12 oz. This type of information is always in the "details" tab. Let us know if you have any trouble finding it. It's directly beneath the video next to the "story" tab. It includes the types of blends being sold, the regions they're made in etc. Why no organic and/or shade grown options? Am I missing it? 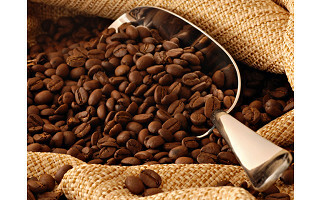 I am very concerned about both the pesticide use and the growing methods in the coffee industry. I do like the fair trade aspect of your company. Thank you in advance for your response! Thanks so much for your comment. I am one of the farmers in our system and the person in charge at Thrive that handles farmer relationships. Our coffee is sustainability grown meaning that we don't use herbicides and pesticides, but we do use conventional fertilizers that are applied in an environmentally sustainable manner. On the shade grown front, all of these coffees are shade grown. shade is key to deliver a specialty grade arabica coffee. The plant can only take 4-5 hours of direct sunlight a day, and shade helps slow the maturation process developing a better, sweeter coffee cherry. Thanks for reaching out, and trying our coffees! Having just toured a Fair Trade, family owned coffee farm in Monteverde last week, I was ecstatic to see this offering! Thank you! Great to hear! Sorry we missed you in Monteverde. I hope you enjoy our coffee! Each package is 12 oz. You can always find this information in the tab labeled "details". It also includes information on the different blends etc. Hope you enjoy the coffee as much as we do. I also would like a package option that didn't include the expresso blend... or better yet "pick you own 2 or 3". If you can add this type of option, please let me know via email so I can place an order. @Emily C Hi Emily. Once you choose the 2, 3, or 6 pack option, an additional dropdown box opens so you can choose the specific flavors you would like to purchase. No espresso is no problem! THRIVE Farmers Coffee is brewing a new approach to selling coffee. Their model gives farmers a central role in the supply chain, which means better coffee for consumers and a better quality of life for the growers. The idea came from THRIVE’s two founders: Kenneth Lander, a retired trial lawyer who moved with his family to a coffee farm in Costa Rica and Michael Jones, an entrepreneur whose father-in-law is a long-time Blue Mountain coffee farmer in Jamaica. In their own way, both of the founders realized that coffee farmers were missing the action, and they envisioned a more profitable system that has farmers involved from seed to cup—including growing, harvesting, milling, roasting, and selling coffee. Their model protects the economic interests of the farmers, who can earn 10 times what they might make in a fair-trade model, and it lets consumers buy straight from the source.